After almost three decades in office, Leon County’s election supervisor is stepping down. One of Tallahassee’s statehouse representatives wants to replace him, but his attendance record in the Legislature might give some voters pause. 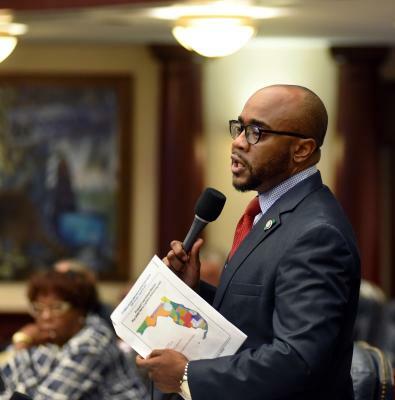 Rep. Alan Williams has served House District 8 for eight years in the Florida legislature. Now with term limits bringing that tenure to a close, he’s running to be Leon County’s next elections supervisor. But back in May, with signs going up and the campaign beginning in earnest, something seemed to be missing. Rep. Williams was in New Orleans during the Frenchtown Candidate Forum. He missed a May 26 forum after skyping in for another event a few days earlier. Then on July 2, he missed the Frenchtown candidate forum. Williams has shown up at some other events, but it turns out spotty attendance is nothing new. Back in February, Representative Marlene O’Toole called for Williams to introduce a bill in the education committee. The Central Florida Republican got silence followed by scattered laughter. Williams eventually showed up to the hearing—one of the five times he was marked present. He missed the committee’s seven other meetings. And that pattern continues in other committees. All told Williams has a 51 percent committee attendance record for the previous session. Rep. Williams in Colorado. He missed a meeting of the Economic Affairs Committee on this trip. The panel voted on 14 bills in that hearing. “A lot of the information that we had before us was more presentations more power points,” Williams pointed out about workshop sessions where no votes are taken. But on closer examination those excuses don’t seem hold up. First, Williams isn’t in senior leadership. He served as Democratic Whip from 2012 to 2014, but currently holds no title. Anyway, the House minority leader, pro tempore, and whip all have attendance records of 76 percent or better. Jim Boyd--the representative with perfect attendance—is the Republican whip. What about missing hearings to present bills in other committees? Comparing every bill Williams sponsored or cosponsored with who presented that bill in committee produces no examples of a Williams absence occurring because he was presenting a bill elsewhere. Williams admits missing hearings where lawmakers saw presentations instead of taking votes—some of those include a Department of Education overview with Secretary Pam Stewart, an explanation of the EPA’s clean power plan, and the governor’s budget proposals for the coming year. Williams missed all of them. Williams’ point about being a part time legislator came up with another lawmaker, too, but he took it in a different direction. Although Williams didn’t break any rules, Gaetz says missing that many meetings can’t be good for a lawmaker or the constituents. But if Williams’ excuses don’t jibe with his absences what was going on? A partial explanation is travel. 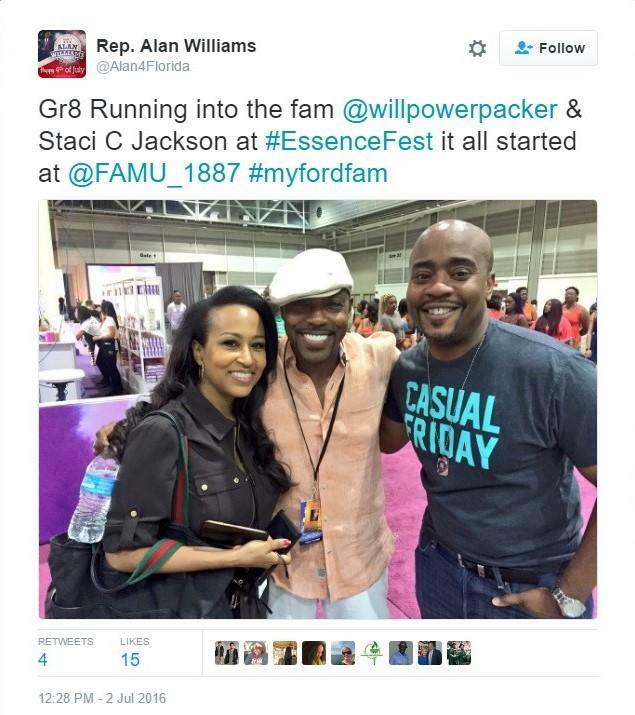 He missed hearings in September and December to attend meetings of the National Black Caucus of State Legislators. 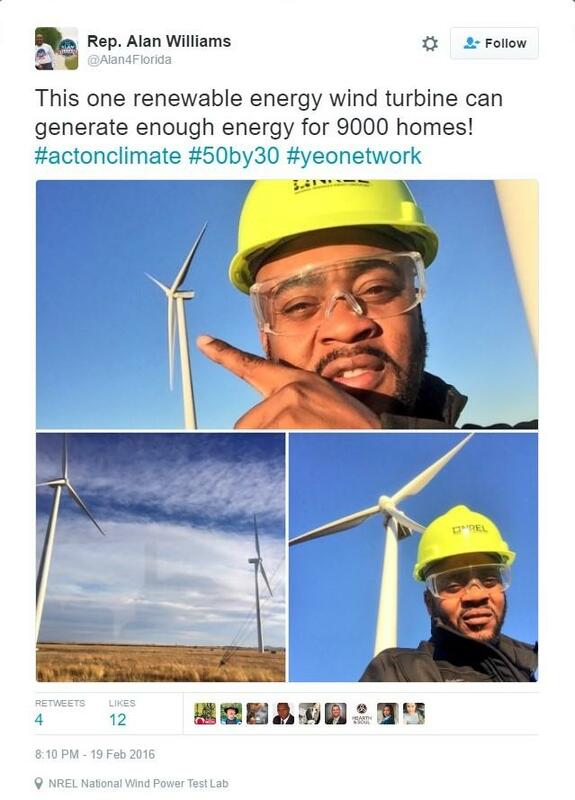 Then in February he went to Colorado for a Young Elected Officials meeting. 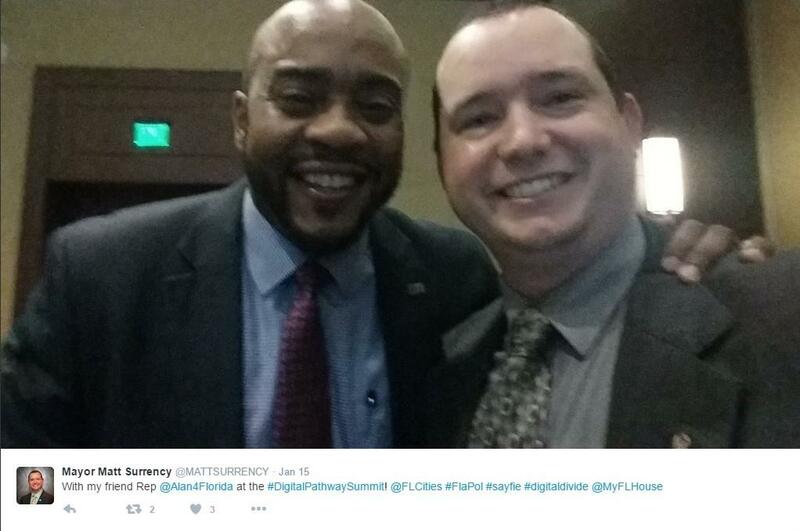 Alan Williams at the Digital Pathway Summit in January with Hawthorne FL Mayor Matt Surrency. He missed a meeting of the House Select Committee on Affordable Healthcare, but no votes were taken. In January House officials turned down his request to attend the HOPE forum in Atlanta. He ended up missing two committee hearings anyway—popping up at the Digital Pathway Summit on Amelia Island. All of these events could help men and women become better lawmakers, but with an attendance record barely better than a coin flip, it’s clear Williams’ attention is divided.